Concrete Handicap Fountains | Petersen Mfg. 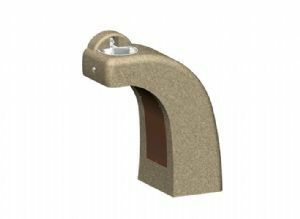 Co. Inc.
DFH drinking fountains are available with an optional side faucet and are built to meet or exceed industries standards. The DFH is a handicap concrete drinking fountain has tamper restistance and freeze proof options. Used by state and federal government agencies, fast food restaurants, department stores, educational facilities, parks & recreation departments and residential complexes. 34" x 14 1/2" x 36"
Dimensions 34" x 14 1/2" x 36"